Several years ago, MAR Online published articles about two Corgi Toys with Golden Jacks and Take-off Wheels: the Rolls-Royce and the Chevrolet Corvette. Now, we present another Corgi with Take-off Wheels! 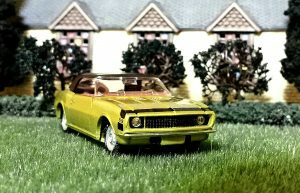 One of their best toy cars was number 338, the Chevrolet Camaro, with Take-Off Wheels from 1968-71. The Camaro had a black plastic top that was removable and a red interior. 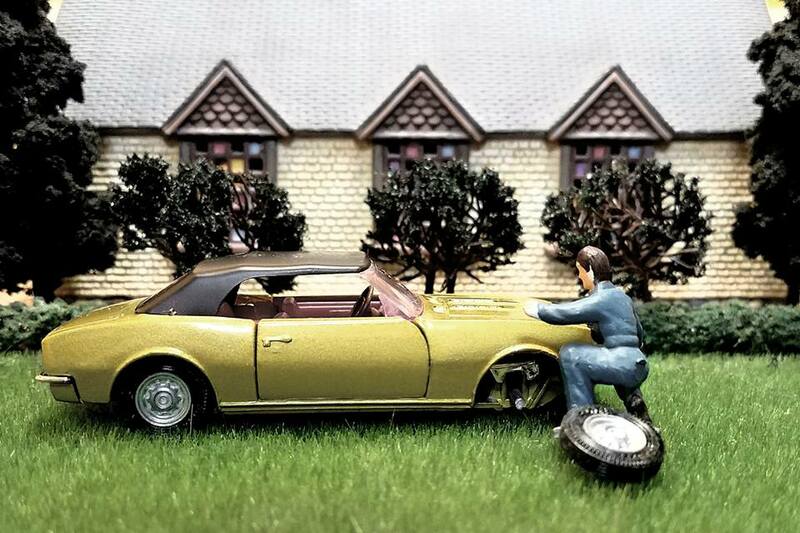 In the photo above you can see a mechanic removing a wheel – he is from another Corgi Toy from that period. The front end is jacked up with the built-in Golden Jack, and the Take-off Wheel has already been removed! What play value! The back of the box shows how the Take-off wheel mechanism works. It also shows the front headlights have small plastic covers that can be slid sideways at night! The picture above shows the covers slid back to reveal the jeweled headlights. The front of the box shows that the original price in $US was not very cheap for the time but quite a bargain now. The front SS stripe can be easily seen as well.